In 1976, one of Turkey’s most successful bands, Moğollar, called time on their career. By then, the Anadolu Pop heroes had been together for nearly a decade. For their swan-song, Moğollar decided to change direction musically, and release an album of instrumental progressive rock. This made sense, as currently, Moğollar didn’t have a lead vocalist. Alas, this was nothing new. Throughout their career, Moğollar seemed to encounter problems with vocalists. They seemed to come and go, never staying long. However, changes to Moğollar’s lineup was nothing new. It had always been somewhat ‘fluid’. Still, Moğollar carried on as normal. That was the case when Moğollar. Later, in 1976, they released their swan-song Moğollar, which ensured that Moğollar bowed out in style. Forty-one years later, and Moğollar was recently reissued by Pharaway Sounds, an imprint of Guerssen Records. It’s a reminder of one Turkey’s greatest groups, Moğollar. Their story began in Istanbul, in 1964, when twenty year old guitarist, Mesut Aytunca and Erol Bilem formed Silüetler. In the early days of Silüetler, they were inspired by one of the popular British group, The Shadows. Soon, Silüetler were popular draw within the local music scene. This gave them the confidence to enter various Turkish music competition. By 1965, Silüetler were faring well in the competitions they entered. Although they hadn’t won, they were always challenging for the top spot. One of the most prestigious competitions was the Altin Mikrofon. Entrants were encouraged to combine Turkish lyrics with Western instrumentation. When Silüetler entered the Altin Mikrofon competition in 1965, they were third. It was a case of so near, yet so far. A year later, and Silüetler were better prepared for the Altin Mikrofon competition. They had spent much of 1966 recording and touring. 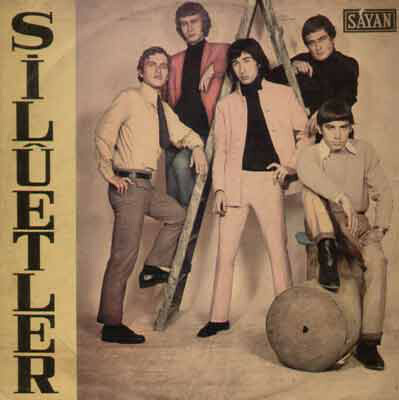 The extensive touring allowed Silüetler to hone the Anatolian rock sound that they had pioneered. This fusion of Turkish folk and rock music proved popular wherever Silüetler played. It also proved popular when Silüetler took to the stage at the 1966 Altin Mikrofon. When the winner was announced, it was no surprise when Silüetler won the first prize. Their star was in the ascendancy. The only problem was that Mesut Aytunca had a tendency to change Silüetler’s lineup to ensure the music stayed relevant. Musicians seemed to come and go. In 1967, two new arrivals were rhythm guitarist and vocalist Aziz Azmet and organist Murat Ses. They were both talented musicians, and were welcome additions to Silüetler. Within a matter of months, the two new arrivals were plotting the musical equivalent of a coup d’état. Aziz Azmet and organist Murat Ses had been planning to form a new band, Moğollar. Before the end of 1967, Aziz Azmet and Murat Ses had recruited nearly ever member of Silüetler. The only man that remainder was one of the two, founder members Mesut Aytunca. His constant changing of Silüetler’s lineup had backfired spectacularly. This was something that the members of Moğollar in 1967 should’ve have learnt from. That wasn’t the case. Within a matter of months, started to change. It wasn’t the occasional change in lineup. Instead, Moğollar seemed to be constantly changing. So much so, that fourteen different musicians were members of Moğollar between 1967-1974. Complicating matters further, was that some of the members of Moğollar were also successful solo artists. They would often head off on tour or into the studio to record an album. These were interesting times for Moğollar. By 1968, Moğollar were already a popular live draw in Izmir, where they played in clubs and even at fairs. This the members of Moğollar knew, was all good experience for the nascent band. Moğollar wanted to hone their sound, especially with the Altin Mikrofon competition fast approaching. They had set their sights on wining it. However, Moğollar had to settle for third prize. Considering Moğollar were still a relatively new band, their Dutch manager Anton Oskamp told the band that this was a good result. Following the Altin Mikrofon competition, Moğollar embarked on a lengthy and gruelling tour of Eastern Turkey. During the tour, Moğollar would play in towns where no rock bands had previously played. In some of the towns, the inhabitants had never heard rock music before. Moğollar were about to become musical pioneers, as they introduced their music to a new and wider audience. As the tour of Eastern Turkey progressed, so did Moğollar’s interest in Turkish folk music. Soon, Moğollar began to expand the array of instruments they took to the stage with. This began when guitarist Cahit Berkay started buying a variety of traditional Turkish instruments including a baglama, kemence, tambura and three string violin. They would augment the instruments that Moğollar usually took to the stage with. Gradually, Moğollar’s sound was evolving. Suddenly, the way Moğollar approached music began to change. They began using Western instruments to play parts in song that normally, a traditional instrument would play. This new sound was born during the tour of Eastern Turkey, but took shape over the next couple of years. In 1970, Taner Öngür christened, the new sound Anadolu Pop in an article in Hey magazine. Despite Taner Öngür coining the term Anadolu Pop, he isn’t regarded as the architect of Anadolu Pop. Instead, Moğollar’s organist and songwriter-in-chief, Murat Ses’ credits his wife Nihal Ses as the true architect of Anadolu Pop. It was pioneered by Moğollar, who were the most successful purveyor of the genre. By 1970, Moğollar were a hugely successful band. They wanted to taste commercial success and critical acclaim further afield. Even if this meant leaving Turkey, and living in Europe. Members of Moğollar were sent to various European cities to try and find a new base for the band. After considering several cities, Moğollar settled on Paris. This was purely because Barış Mango lived in Paris, and offered Taner Öngür somewhere to stay. Suddenly, Paris looked very appealing for Moğollar’s new European base. The rest of Moğollar found accommodation elsewhere in Paris. Now they could begin looking for a recording contract. Not long after Moğollar arrived in Paris, they looked through the telephone book and made a list of all the record companies based in the city. They started phoning each one, in the hope that one of the record companies, would offer them a contract. Eventually, CBS offered Moğollar a three year contract. This was the start of a new chapter for Moğollar. Danses Et Rythmes De La Turquie D’Hier À Aujourd’hui. Soon, Moğollar went into the studio to record Hitchin’, their first single for CBS. When Hitchin’ was released, it became the first single that Moğollar had recorded in English. 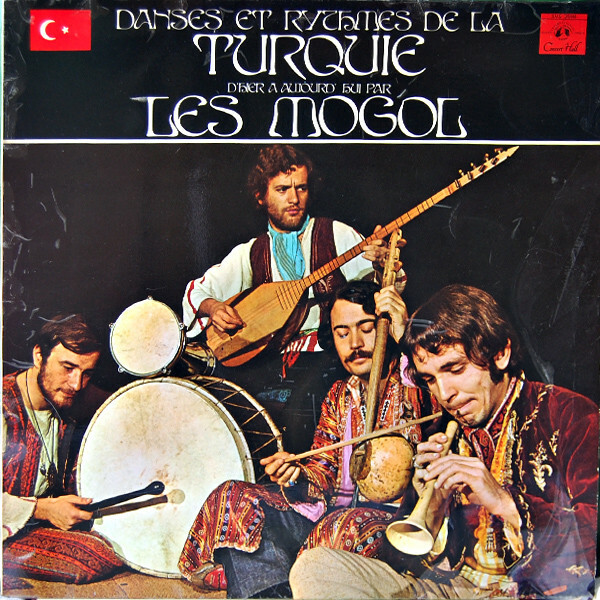 Later in 1971, Moğollar released their debut album Danses Et Rythmes De La Turquie D’Hier À Aujourd’hui in France and Turkey. It featured new songs from. This won them the Grand Prix du Disque award, and Moğollar’s star was in the ascendancy. Following the release of Grand Prix du Disque, Moğollar started planning a tour. Before the tour could begin, Moğollar began looking for a new lead vocalist. After a couple of singers turned them down, Barış Mango agreed to tour with Moğollar. It was tantalising prospect, that two of the leading lights of Turkish music were about to head out on tour. Everyone involved was similarly excited. So much so, that Moğollar decided to changed the band name to Manchomongol for the tour. It got underway later in 1971. One member of Moğollar was missing, Engin Yörükoğlu. He had returned home to Istanbul to get married, but didn’t rejoin Moğollar. Instead, he remained in Istanbul until 1972, when he joined Barış Mango and Kurtalan Ekspres. That would prove ironic. The tour wasn’t as enjoyable as Moğollar and Barış Mango had hoped. They thought that two titans of Turkish music touring, was going to be the experience of a lifetime. After four long months, that was far from the case. A turning point came in Kütahya, when someone took offence to Barış Mango’s long hair and blew the tour van up. Everyone was shaken by this. Not long after this, Barış Mango caught mumps and had to leave the tour. Trying to find a replacement at short notice wasn’t easy. However, they recorded with Selda and Ersen and then began touring with Cem Karaca. That tour would last two years. Sadly, one of the members of Moğollar would’ve left the band before the tour ended. This was organist and songwriter-in-chief Murat Ses. He was looking through Hey magazine in 1972, when he noticed an article about Moğollar. As Murat Ses read the article he was in for a surprise. Guitarist Cahit Berkay had announced that Murat Ses had left Moğollar. The reason given, was he no longer wanted to play concerts in small villages in Eastern Turkey. This was all news to Murat Ses. That day, he was unceremoniously ousted from the band he cofounded. What those who plotted Murat Ses’ removal had overlooked, was his importance within Moğollar. Not only did he write the majority of the songs, but his organ played an important part in Moğollar’s music. The loss of Murat Ses could be a turning point for Moğollar. However, some saw this as just the latest change in Moğollar’s lineup. After Murat Ses’ departure from Moğollar, Cahit Berkay became Moğollar’s de facto leader. Before long, most of the band were working on side projects. That was apart from Cahit Berkay. As time passed by, he decided the time was right for Moğollar to try and make a breakthrough in the European market. If that was going to happen, Cahit Berkay had to convince one former member of Moğollar to return to the fold. That was Engin Yörükoğlu. He was still living in France, so Cahit Berkay journeyed from Istanbul to see his old bandmate. This was something of a mercy mission, as Moğollar seemed to be teetering on the brink. Maybe if Engin Yörükoğlu rejoined Moğollar, then it would have a future? At the meeting in France, Engin Yörükoğlu agreed to rejoin Moğollar. Three years after the release of their debut album, Moğollar were about to begin work on their sophomore album. Before that, Cahit Berkay returned home to Istanbul with the news that Engin Yörükoğlu was rejoining Moğollar. When the rest of Moğollar heard the news, they began packing their instruments onto a pickup truck. This included Romain Didier, who would play Fender Rhodes and Minimoog. They would then be joined by Engin Yörükoğlu in the studio. Before that, Cahit Berkay assumed the role of songwriter-in-chief. He penned nine of the eleven songs. Romain Didier contributed Rue De L’orient, while Moğollar covered the traditional song White Dear. These eleven songs would eventually become Moğollar’s sophomore album Hittit Sun. 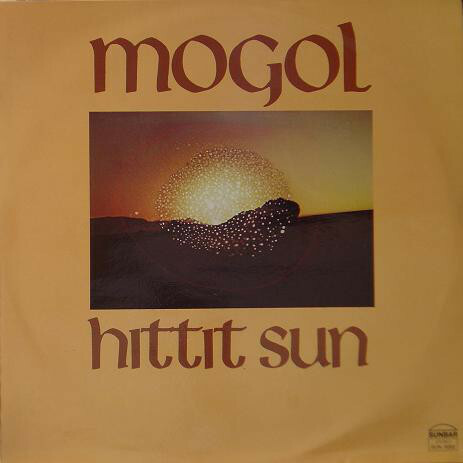 As work began on Hittit Sun, Moğollar’s music moved towards progressive rock and jazz. This was very different to their usual Anadolu Pop sound. It was no surprise. Music had changed since Moğollar released their debut album in 1971. Moğollar knew they had to reinvent their music to stay relevant. However, how would their fans respond? When Moğollar’s sophomore album was released in Turkey in 1975, it was entitled Düm-Tek. By then, four years had passed since they had released their debut album. Düm-Tek wasn’t a commercial success in Turkey. Elsewhere, the album was released as Hittit Sun. Despite what was an ambitious and accomplished album, Hittit Sun failed to find an audience. It was a disaster for Moğollar. Despite the commercial failure of Hittit Sun, Moğollar weren’t willing to give up on their dream of making a commercial breakthrough in Europe. It was looking increasingly unlikely, but Moğollar were determined to give it one more go. 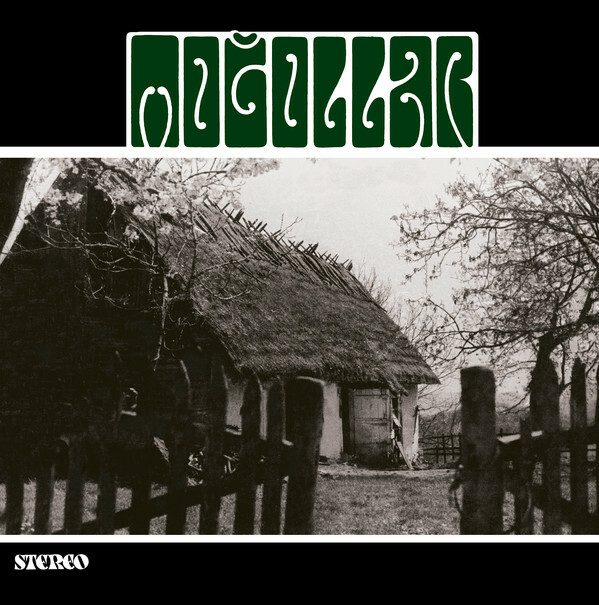 So work began on Moğollar’s third album in 1976. It featured Turkish folk songs; Azerbaijani folks song, classical pieces and B-Sides. The album opener Kâtip Arzuhalim Yaz Yare Böyle was from the days of Manchomongol in 1971. These tracks would eventually become Moğollar’s eponymous third album. For Moğollar, the sound had been stripped back to just the rhythm section and keyboards. By then, drummer and percussionist Engin Yörükoğlu and rhythm guitarist Cahit Berkay were the longest serving members of Moğollar. The rest of the band were relative newcomers. Again, they took charge of arranging the eleven tracks that later in 1976, became Moğollar. 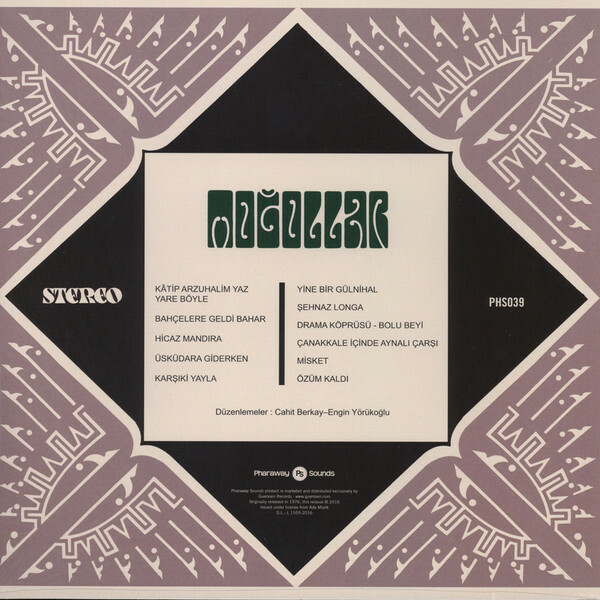 When Moğollar was released on the Diskotür label in 1976, it followed in the footsteps of Hittit Sun and failed commercially. For Moğollar the dream was over. The band decided to call it a day. Moğollar was their swan-song. Kâtip Arzuhalim Yaz Yare Böyle opens Moğollar. Just a lone folk-tinged acoustic guitar plays. It’s panned and encircles the listener. Then Moğollar throw a curveball and it’s all change. Out of nowhere the rest of the band enter. An acoustic guitar is panned left, while pitter patter percussion and a glistening guitar are panned right. The bass provides the heartbeat, as the music is variously wistful, hopeful and beautiful as musical genres melt into one. Traditional Anatolian percussion opens Bahçelere Geldi Bahar while searing guitars power the arrangement along. They’re played with speed and precision as the arrangement dances along, the music of the past and present combining melodically. Drums and percussion combine as Hicaz Mandıra bursts into life. Guitars are added as West meets East in this urgent and irresistible track. Soon, there’s a progressive rock influence that combines ancient Anatolian melodies. Later, the guitars drop out leaving just a percussive masterclass. Before long, Moğollar reunite and the tempo builds. They never miss a beat, as the percussion, drums and guitars lock into a groove before the track reaches its impressive crescendo. As a guitar is played with speed and precision on Üsküdara Giderken percussion provides a rhythmic accompaniment. Soon, the guitar double is added, and they’re panned right and left. Still the rattling and mesmeric percussion adds an urgency. Then when the guitar on the right drops out, the rattling and metallic percussion proves the perfect foil for the guitar. It’s only towards the end that the two guitars unite on this tale of two guitars and a myriad of mesmeric percussion. Drums pound, percussion gallops and traditional stringed is played Karşıki Yayla. Together, they’re played with an urgency and produce a joyous sound. Later, a blistering, effects laden psychedelic guitar adds a contrast as it cuts through the arrangement. It drops out and reappears, and plays a starring role. Meanwhile, the percussion and drums are reduced to playing a supporting role in this joyous, dramatic and memorable slice of Anadolu Pop. Moğollar play carefully and deliberately on Yine Bir Gülnihal. Guitars join with strings as the arrangement meanders along. That is until the tempo rises, the arrangement flows along, before almost pausing. Again, the tempo rises and sweeps along chirping guitars and flourishes of strings combine. The result is a quite beautiful, emotive and progressive instrumental. As Şehnaz Longa unfolds, percussion and drums join with guitars. It’s the guitar that’s panned left that plays a starring role. Cahit Berkay fingers fly up and down the fretboard. His playing is flawless, during what’s the equivalent to a musical masterclass. Meanwhile, the percussion provides an accompaniment, and Engin Yörükoğlu seems to have been inspired by, Cahit Berkay as they reach new heights. On Drama Köprüsü-Bolu Beyi drums and percussion lead the way, and create an Eastern sound. Soon, the rest of Moğollar enter and they play as one. Guitars and stringed instruments have been added and augment the sound. A drum adds an element of drama, before a searing guitar cuts through the urgent, but melodic arrangement. It comprises layers of instruments and influences that melt into one. A drum beats out a rhythm while a shimmering guitar adds a contrast on Çanakkale İçinde Aynalı Çarşı. So does the wistful sound of the violin that’s panned left. Meanwhile, an acoustic guitar is panned right. Occasionally, it’s joined by washes of shimmering electric guitar. Still the drum plays ominously, as the violin adds a melancholy, ruminative sound. When it drops all that remains is the distant guitar and mesmeric beat as Moğollar continue to tug at the heartstrings. Cahit Berkay’ stringed instrument is panned left on Misket. It’s joined by Engin Yörükoğlu’s percussion. Soon, the tempo builds and there’s an urgency as their traditional Turkish folk song begins to build. As the tempo rises, Cahit Berkay and Engin Yörükoğlu match each other every step of the way, before eventually, Misket reaches a crescendo. Closing Moğollar is Özüm Kaldı. Straight away, there’s an urgency as the buzzing guitar joins the acoustic guitar and clunky percussion. Soon, flamboyant flourishes of acoustic guitar and percussion combine and the arrangement almost dances along. Soon, they’re joined by a scorching guitar. It’s added just at the right time, and proves effective. Later, a guitar buzzes and hangs in the air, and Moğollar take their bow. Sadly, for Moğollar their eponymous third album was the end of what had been a long and eventful musical journey. They left behind a rich musical legacy, which included was around twenty singles and three albums. The last of this trio of albums was Moğollar. It’s a captivating fusion of ancient Anatolian melodies and instruments which is combined with elements of classical music, progressive rock and psychedelia. Add to that, Eastern sounds and bursts of fuzzy guitar. The result is a heady brew that comprises Turkish folk songs; Azerbaijani folk song, classical pieces and B-Sides. Sadly, Moğollar wasn’t a commercial success. When Moğollar followed in the footsteps of Hittit Sun, and failed to find the audience it so richly deserved, that was the last straw for Moğollar. They called time on their career. After eight years together, Moğollar the remaining members of the band went their separate ways. The Moğollar was a case of what might have been. They never really built on the commercial success and critical acclaim that their 1971 debut album Danses Et Rythmes De La Turquie D’Hier À Aujourd’hui. The problem was, that Moğollar waited too long to release their sophomore album Hittit Sun. By 1975, music had changed. Moğollar knew they had to change direction to stay relevant. Moving away from their original sound seemed to alienate their fan-base. To make matters worse, Hittit Sun passed the wider record buying public by. They missed out on ambitious and accomplished album, that has since become a cult album. Sadly, history was to repeat itself a year later when Moğollar was released. Like many albums that passed record buyers by first time round, it started to find an audience long after its release. Noways, original copies of the album are hard to come by. When they become available, it’s for large sums of money that’s beyond most record buyers. Fortunately. 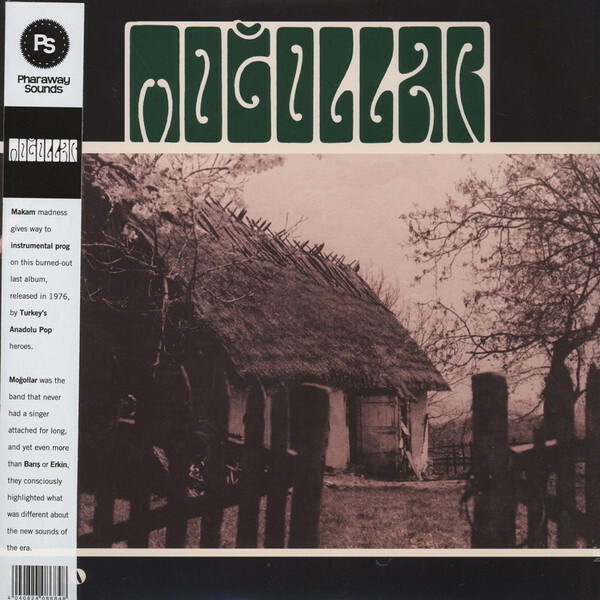 Moğollar was recently reissued by Pharaway Sounds, an imprint of Guerssen Records. It’s a reminder of one Turkey’s greatest groups, as the first chapter in the Moğollar came to an end. When the Moğollar split-up in 1976, it looked like the end of the line for the group. However, eighteen years later and Moğollar reformed. They released five new studio albums between 1994 and 2009. Not only were Moğollar back to stay, but they were popular than ever. While this was a welcome return, for many of their fans Moğollar’s first three albums feature the band at their very best. This includes Moğollar, where a myriad of disparate music influences and instruments are combined to create a heady, mesmeric and delicious musical brew.